The top theatre in the capital over the past 12 months. Any venue based in Greater London is eligible. Judged on criteria including (but not limited to) artistic quality, business success, innovation. London’s reigning theatre of the year enjoyed another impressive 12 months under Rupert Goold ’s leadership. This year kicked off in style with a production of The Twilight Zone, now destined for the West End in 2019. It will follow a series of hit Almeida productions that have made the short trip from Islington to Theatreland in recent years, the most recent being Summer and Smoke, a superb Tennessee Williams revival that was directed by new Almeida associate Rebecca Frecknall. 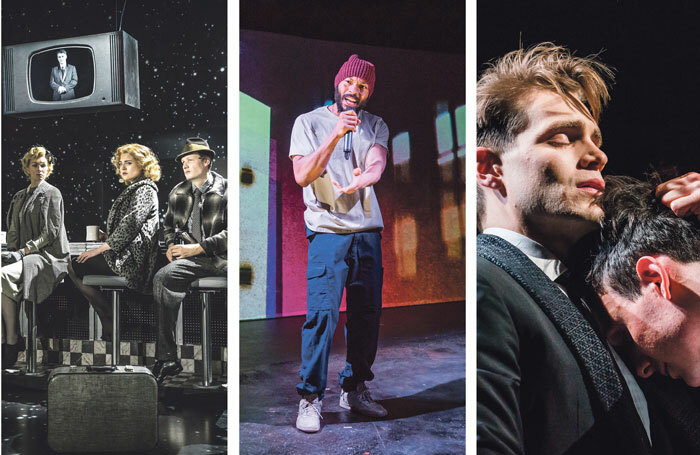 Other highlights at the theatre’s north London base included Ella Hickson’s provocative The Writer  – nominated for best play at the Evening Standard Theatre Awards  – and Dance Nation  by Clare Barron. Meanwhile, associate director Robert Icke  followed up his productions of Mary Stuart  and Hamlet  (the former transferring to the West End  and the latter broadcast by the BBC in 2018) with a radical reinterpretation of Ibsen’s The Wild Duck. Offstage, the Almeida continued its excellent work developing young audiences, supplemented with the creation of a Youth Advisory Board, made up of 18 to 25 year olds, aimed at diversifying the industry’s future leaders. Next year, Ink – a West End hit in 2018 – will transfer to Broadway. Madani Younis’ final year as artistic director of the Bush Theatre proved a suitable swansong. Under his tenure, the west London venue has been reinvented  both physically and in terms of its ethos, with programming that aims to reflect the diverse make-up of its Shepherd’s Bush audiences. The year included Winsome Pinnock’s Leave Taking , part of Younis’ “passing the baton” initiative, which commits to producing one play a year by a British writer of colour from the 20th century. Other highlights included two shows that became hits in Edinburgh: The Believers Are But Brothers  by Javaad Alipoor , and the return of Monica Dolan’s award-winning play The B*easts . However, it was Misty by Arinze Kene that gave the Bush its standout hit of the year, subsequently moving to Trafalgar Studios in the West End. It explored the complexity and pressure of being a black artist. Other critical successes at the Bush included Vinay Patel’s epic An Adventure , and Ben Wetherill’s Jellyfish , which featured two neurodiverse cast members. As Younis prepares to hand over the running of the theatre to Lynette Linton , he passes on energised audiences and a theatre boasting diverse programming that reflects 21st-century London. It was a year of two halves – both impressive – at the Young Vic . The beginning of 2018 was commissioned by outgoing artistic director David Lan, and ended with Kwame Kwei-Armah ’s first programming choices . Lan handed over a theatre in fine artistic health, following a run of some of the year’s most critically acclaimed productions. The Inheritance  garnered rave reviews at the south London venue before transferring to the West End, where it joined The Jungle , which also originated at the Young Vic. Jeanine Tesori  and Lisa Kron’s tender musical Fun Home  also received its UK premiere on the Cut, although it has yet to follow up with a commercial transfer. Kwei-Armah kicked off his tenure with a vibrant staging of Twelfth Night , a musical version of Shakespeare’s comedy, featuring community cast members, underlining the new leader’s mission to ensure the venue is open to everyone. It’s still early days for Kwei-Armah’s tenure, but it got off to a promising start. Kwei-Armah said that “access for all” was already in the theatre’s DNA, but he aimed to “augment that”. As if to prove that point, he announced that tickets for the first preview of every production in the main house will be priced at just £5.